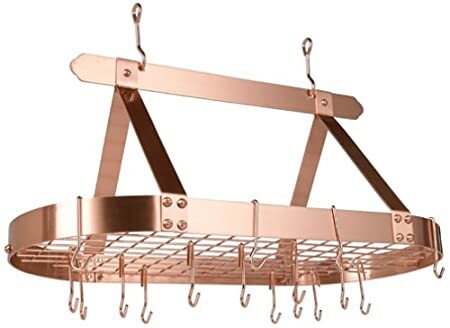 101BZ Old Dutch Rectangular Hanging Pot Rack with Grid & 24 Hooks, Oiled Bronze, 30" x 20.5" x 15.75"
104SN Old Dutch Wall-Mount Bookshelf Pot Rack with Grid & 12 Hooks,Satin Nickel, 36.25" x 9" x 11.5"
107GU Old Dutch Oval Steel Pot Rack w. Grid & 16 Hooks, Graphite, 36" x 19" x 15.5"
This 16-hook pot rack gives you plenty of hanging space for your pots and pans. The center grid can also serve as a shelf to store books, lids, or any other cooking necessities. 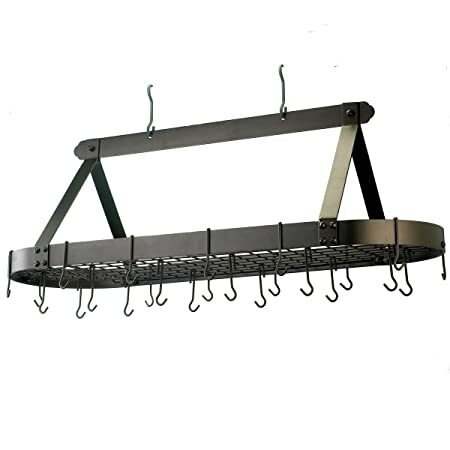 Constructed of heavy-gauge steel, this pot rack is strong enough to support everything you need to hang. Dont worry about cluttering your kitchen ever again, this pot rack is a convenient space saver. 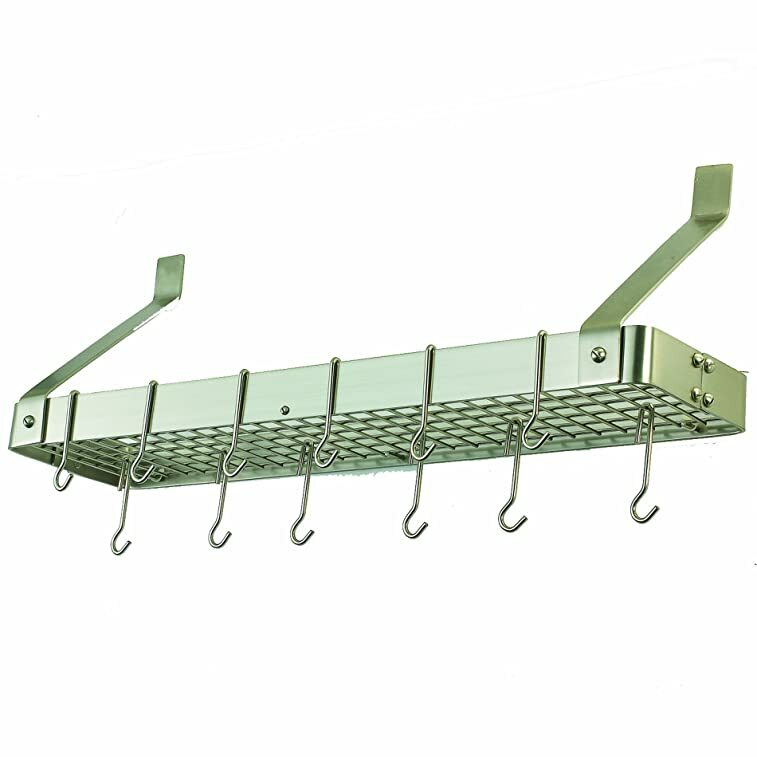 Includes grid, 16 hanging hooks and mounting hardware. Finished with a durable yet easy to maintain Graphite coating. Assembly required. 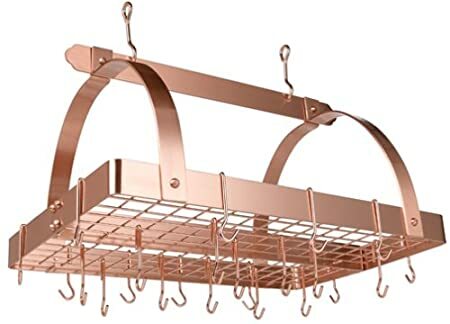 101CP Old Dutch Rectangular Hanging Pot Rack with Grid & 24 Hooks, Satin Copper, 30" x 20.5" x 15.75"
107SN Old Dutch Oval Steel Pot Rack w. Grid &16 Hooks, Satin Nickel, 36" x 19" x 15.5"
This 16-hook pot rack gives you plenty of hanging space for your pots and pans. The center grid can also serve as a shelf to store books, lids, or any other cooking necessities. 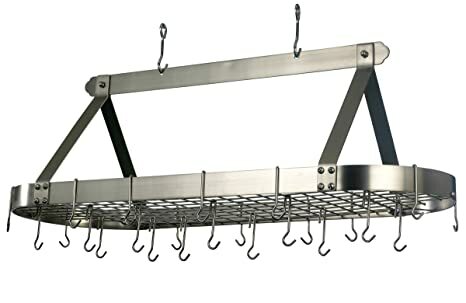 Constructed of heavy-gauge steel, this pot rack is strong enough to support everything you need to hang. Dont worry about cluttering your kitchen ever again, this pot rack is a convenient space saver. Includes grid, 16 hanging hooks and mounting hardware. Finished with a durable yet easy to maintain Satin Nickel exterior. Assembly required. 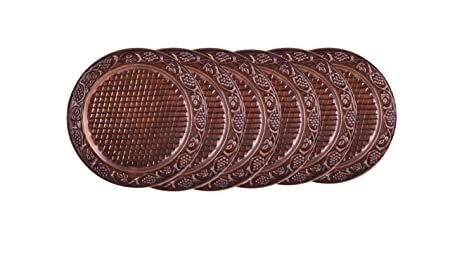 Create an elegant table top for a special occasion or for displaying your favorite dishes with these hand embossed set of 6 charger plates. Oval Hanging Pot Rack. 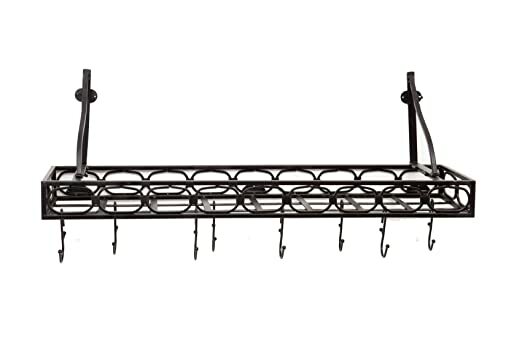 Includes grid, 12 hanging hooks, chains & mounting hardware. 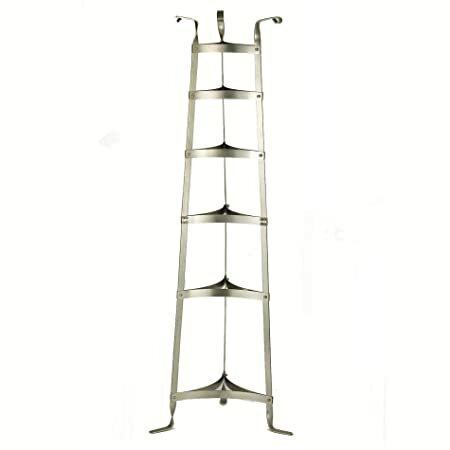 Made of Sturdy Steel, the Satin Copper Finish is lacquered for easy maintenance. 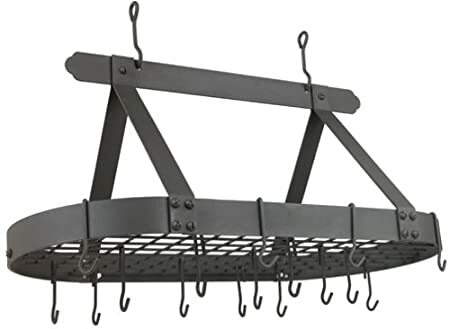 103MB Old Dutch Bookshelf Pot Rack with 8 Hooks, Matte Black, 36.25" x 9" x 12"
107CP Old Dutch Oval Steel Pot Rack w. Grid & 16 Hooks, Satin Copper, 36" x 19" x 15.5"
This 16-hook pot rack gives you plenty of hanging space for your pots and pans. The center grid can also serve as a shelf to store books, lids, or any other cooking necessities. 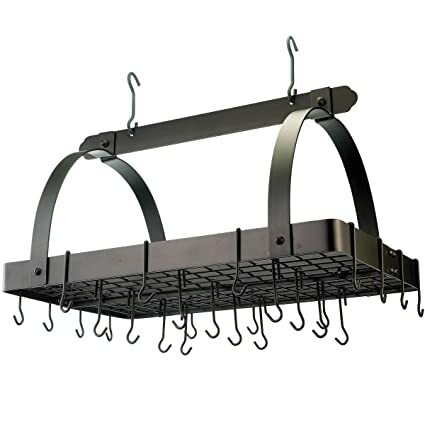 Constructed of heavy-gauge steel, this pot rack is strong enough to support everything you need to hang. Dont worry about cluttering your kitchen ever again, this pot rack is a convenient space saver. Includes grid, 16 hanging hooks and mounting hardware. Finished with a durable yet easy to maintain Satin Copper exterior. Assembly required. 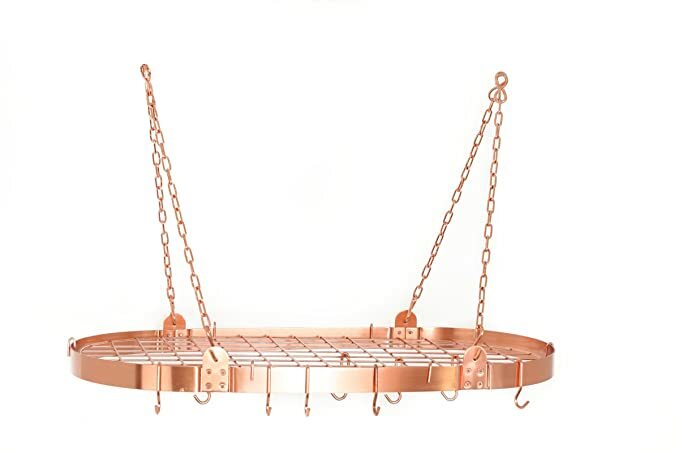 107BZ Old Dutch Oval Steel Pot Rack w. Grid & 16 Hooks, Oiled Bronze, 36" x 19" x 15.5"
This 16-hook pot rack gives you plenty of hanging space for your pots and pans. The center grid can also serve as a shelf to store books, lids, or any other cooking necessities. 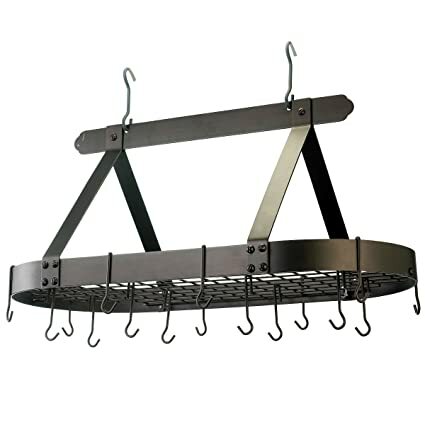 Constructed of heavy-gauge steel, this pot rack is strong enough to support everything you need to hang. Dont worry about cluttering your kitchen ever again, this pot rack is a convenient space saver. Includes grid, 16 hanging hooks and mounting hardware. Finished with a durable, easy-care metallic bronze powder coating. Assembly required.